As part of my efforts to better rationalize my ridiculous collection of books, I had comitted to focus on digital copies for certain ranges. One of the lines of books that I've shifted to digital is the new Star Wars canon given I still have a significant number of Legends books still occupying a lot of my shelf space. And so I've been slow to fully wade into the newer books since I'm also trying to hold out for getting the books either (1) when they're on sale or (2) only when I'm literally about to read them. Star Wars: The Rise of the Empire was an economical choice that I managed to get on sale since it consists of 2 full novels and 3 short stories all collected in a single volume. I haven't seen collections like this very often among Star Wars books apart from the novels based on the movie trilogies, so this was quite amusing. And a smart purchase as well, right? And given the end of Star Wars Rebels, I had a new interest in reading the fiction related to Kanan and Hera. And this was a great way to get my hands on that particular book. 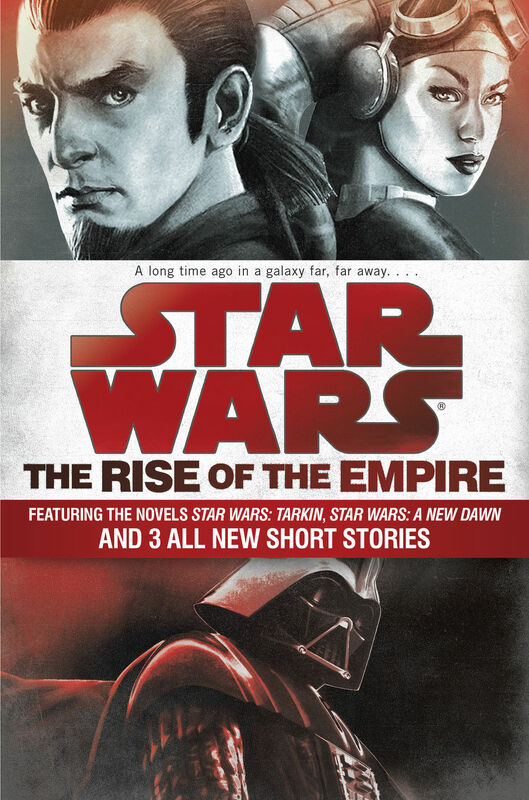 Synopsis: Star Wars: The Rise of the Empire is the compilation of Tarkin, A New Dawn and 3 short stories related to the characters featured in the two novels. The short stories act as bridge tales that provide more background on one of the characters. I had previously reviewed an advance copy of Tarkin by James Luceno so this was me finally buying a copy of the book for myself. The book starts with the short story Bottleneck by John Jackson Miller with a focus on Grand Moff Wilhuff Tarkin. He has been tasked with addressing efficiency concerns with armor production and is accompanied by Count Vidian, who figures more in New Dawn. After Tarkin is the short story Mercy Mission by Melissa Scott that focused on Hera Syndulla trying to get supplies to Ryloth past an Imperial blockade. A New Dawn is next and this is a rather involved story by John Jackson Miller and is a prequel of sorts to Star Wars: Rebels as it is set 6 years before the show. Here Kannan is working as freight pilot for the Thorilide mining operation in the Gorse system when Count Vidian arrives on the Imperial Star Destroyer Ultimatum under the temporary command of Captain Rae Sloane. At the same time, Hera Syndulla is making her way in-system on the Ghost in an effort to get to the planet and continue her own mission to monitor Count Vidian and get a better read on what kind of a threat he poses. Then the book ends with the short story The Levers of Power by Jason Fry and it focuses on Raw Sloane, who is an Admiral by the time of the events of the Battle of Endor. This book focuses on how she handles her forces during that battle and the eventual rout of Imperial forces. What I Liked: All the stories in this book nicely worked together and I appreciated how the short stories made for good in-between reading material that loosely linked the two books. It just goes to show that there's still so much we don't know about even established characters like Grand Moff Tarkin as both Bottleneck and Tarkin tried to address. And at the same time the books are clearly setting up new characters like Rae Sloane to have larger roles in the new canon of the Expanded Universe. And while I enjoyed the new insights from Tarkin, A New Dawn is really the meat and potatoes of this collection as it provides a lot of interesting character insight and build-up for Kanan and Hera. This book covers their first meeting and how Kanan finally shifts away from pure survival mode in this post Order 66 galaxy and takes those steps to start becoming the hero he was meant to be. And there's the other hurdle of Hera learning to trust him given he first appears as a trouble-making drunk in a dead-end job in the Outer Rim. What Could Have Been Better: The introduction of Count Vidian was a weird piece as it's not exactly expected in this setting to focus on an "efficiency expert". Given a lot of his tactics seem similar to the acts of brutality that inform the "Tarkin Doctrine", it's hard to understand what really sets him apart from others in the Imperial hierarchy. And given his story arc sort of starts in Bottleneck and largely resolves in New Down, it's not exactly a very lengthy career. Admittedly the story of Sloane in The Levers of Power was one of the most interesting in the book but annoyingly brief as it was only meant as a sort of teasing epilogue. You get snippets of her in Bottleneck and A New Dawn but man it's not enough given the role she plays in the end. She is teased as a great character perhaps a bit too well. TL;DR: Star Wars: The Rise of the Empire is an interesting collection but one that was well thought out and nicely tied together with the addition of the new short stories. They're not perfectly matched as a theme but they're all great stories on their own and are a good deal to get in one volume. Thus the collection gets a great 4 efficiency tweaks made by Tarken and Vidian out of a possible 5.